New album, ‘Nightbringers’, becomes best-selling direct-to-consumer pre-order in Metal Blade Records‘ history! * exclusive bundles with a shirt, plus digital options are also available! 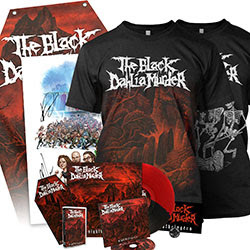 This October/November, The Black Dahlia Murder will embark on a North American trek in support of Nightbringers, along with Suffocation, Decrepit Birth, Necrot, and Wormwitch. See below for all dates.